This question has been asked of me several times today. I have heard everything from I don’t want my kids to be slobs to I don’t want them to expect me to wait on them hand and foot. This next week I am going to focus on how we can get our children to keep their rooms clean. Tell your friends to join us this week. Sign up for our messages. I have told you many times that I have to practice what I preach. This goes for you too. Why in the world would your children want to keep their rooms clean, when the rest of the house looks trashed? You cannot tell them to clean their room with yours looks awful. I have also told you when I make mistakes. I am human. You all seem to relate to me when I have the same problems that you have. Your children will appreciate your honesty as you do mine. I want you to have a family meeting and tell your family that you have not set the example for them that they need as far as your housekeeping skills are concerned. Apologize to them. Ask for their help and tell them you want to change and you have found this bossy woman to tell you what to do. Explain how our routines work. Share your dreams for your home and your family. When you finally set a FlyBaby example for your babies, you will begin to see the whole family pitch in, because a clean and tidy home frees everyone up to have friends over without embarrassment. Your children will be so proud of their Mom and themselves. I promise this will happen. Babysteps. Here is cute video of a 4 year old cleaning his room. Here is the God Breeze that filled my sails today. My 10 year old son agonizes over his room. I shared what I was just starting to do with you ladies and invited him to become a “Flybaby” with me. We went into his room and decided that his nightstand would make a great “kitchen sink”. We did our first hotspot together yesterday. He chose the clothes on his floor. Tomorrow he will follow our morning routine and has decided that his dresser top will be his next hotspot. We will put the rest of his room in 30 gallon Rubbermaid containers and tackle them one by one. He’s excited that he doesn’t have to clean his room all at once. I told him “it didn’t get that way in a day, and you won’t have to clean it up in a day”. I can’t begin to tell you what a relief it is to not have to pressure him to get his room clean in one full swoop. I feel free and the guilt has lifted. BTW, when I first made my sink clean and shiny I found areas to clean on the drain area that I never knew existed before – LOL! I was also able to take that monstrosity of a dish drain off the counter and shove it under the sink. Thanks, FlyLady, for the sink full of soapy water idea while making dinner. Dishes are done in no time. Why didn’t I think of all this before? What a revelation!! Two generations of Flybabies under one roof. Talk to your family, don’t yell and fuss. Set your example and work together. Get your child their own timer. They thrive when you make things fun! This Calendar is large enough to hold your family’s busy schedule! Jump in where we are! 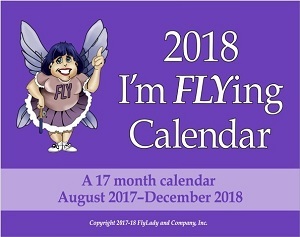 There are nine months left on this calendar. Don’t wait another six months and suffer with a small calendar. It is 14 inches wide and 21 inches long when opened. This is a great way to keep your family organized! Make It Fun and your family will use it! Put your calendar in a central location and your family will start using it! This entry was posted in Morning Musing and tagged clean, clutter, flylady, kids, rooms. Bookmark the permalink.